CISA publishes a variety of information to keep you informed—from our Annual Reports and Farm Products Guide to newsletters and “how-to” manuals. 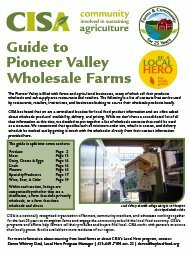 Our annual guide to Local Hero farms, restaurants, institutions, specialty food producers, and garden centers is available here as a pdf. Read our archived e-newsletters. Be sure to stay connected throughout the year—sign up for our free monthly e-newsletter. Our annual reports from 2018, 2017, 2016, 2015, 2014, 2013, 2012, 2011, 2010, 2009, 2008 and 2007 are available for download. The Pioneer Valley is filled with farms and agricultural businesses, many of which sell their products wholesale and can supply area restaurants and retailers. This guide is a list of contacts that can be used by restaurants, retailers, institutions, and businesses looking to source their wholesale products locally, divided by product (Produce; Meat; Dairy, Cheese, & Eggs; Grain; Flowers; Specialty Producers; Wine, Beer, & Cider). This guide was last updated in October of 2018. Read the full guide here. 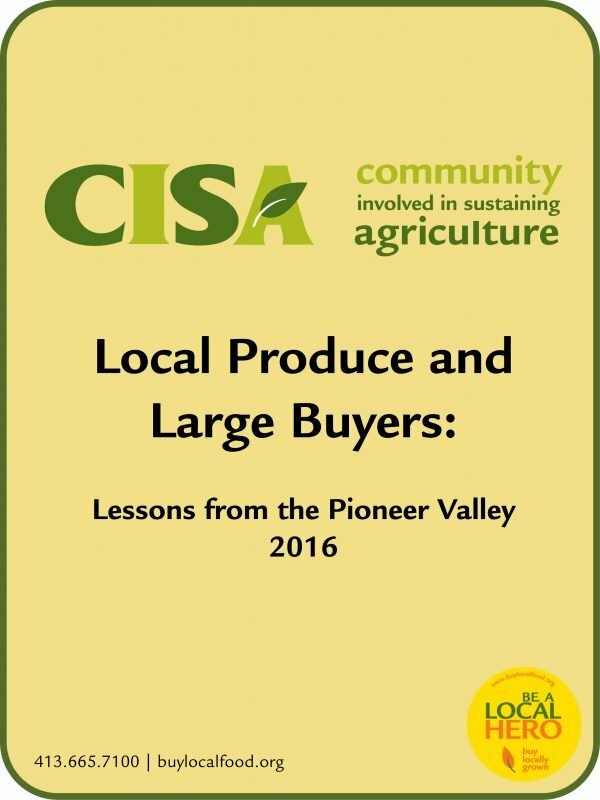 This 2016 study provides a detailed understanding of production, distribution, and demand patterns for local produce sold to larger buyers in the Pioneer Valley, and identifies pressure points where improvement is needed. Interviews with farmers, buyers, distributors, and processors revealed a marketplace for locally grown produce that is both promising and fragile. In this environment, greater financial and technical support is crucial in enabling farms to strategically evaluate and develop new markets as well as meet new buyer requirements. Read the executive summary or download the full report. 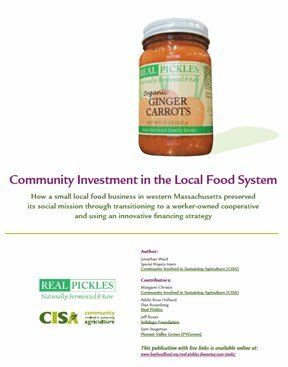 This 2014 case study provides a detailed explanation of how a small local food business in western Massachusetts preserved its social mission through transitioning to a worker-owned cooperative and using an innovative financing strategy. Local Hero member business Real Pickles makes naturally fermented and raw pickles from regionally-grown vegetables in Greenfield, Massachusetts. Instead of selling their growing company to a large industrial food corporation, Real Pickles’ owners chose to keep the business small, locally owned, and mission-driven. In 2012, the company converted to a worker-owned cooperative, and funded the co-op’s purchase of the business through a highly successful community investment campaign that raised a half-million dollars. Download the case study. Filling your family’s table with food from local farms is a delicious way to support farm businesses in your community. But you can do more to support a vibrant local food economy! 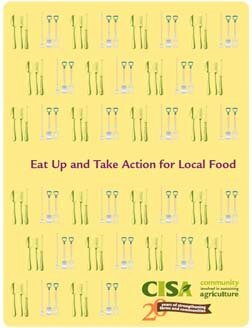 Eat Up and Take Action for Local Food, provides resources and encouragement to bring your love of local to your workplace, your volunteer activities, and your friends and family. Get inspired to take action! Download the resource book. Photo credit: Ivy Ashe for the Vineyard Gazette. This 2013 report assesses challenges in commercial meat processing in the Pioneer Valley and provides recommendations for improving producer education and coordination, reducing costs, and expanding options for meat processing such as cutting and curing. The report includes detailed feasibility analysis of a stand-alone meat processing facility, the addition of meat processing services to an existing shared-use commercial kitchen, and an appendix that provides an overview of USDA regulations and how they are applied in Massachusetts. View the report. 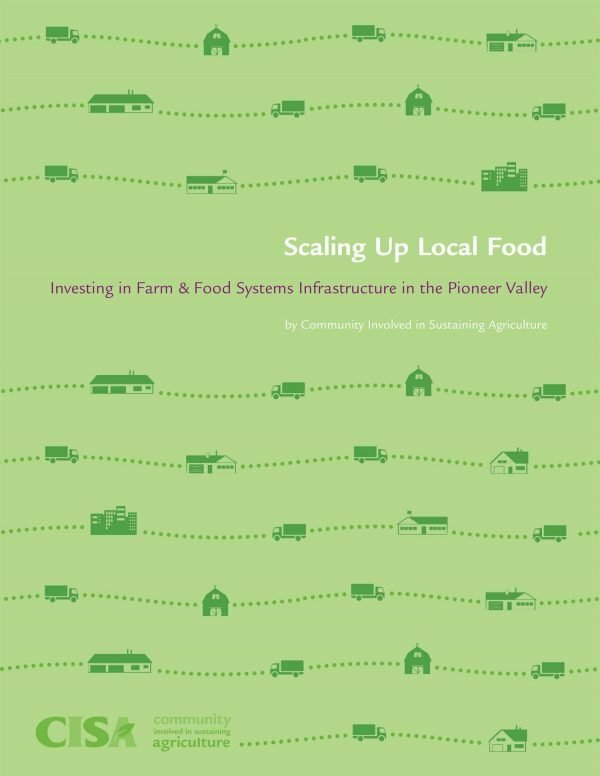 CISA’s report, published in the fall of 2011, provides real-life, local examples of the successes, challenges and opportunities in the Pioneer Valley food system today. Consumers, farmers, businesspeople, investors, planners, and policy-makers will find suggestions for action to help create a local food system that provides more local food to more residents of our region. Download the report. Published in 2001, this is a toolkit for organizations interested in starting a “Buy Local” campaign. Visit our “Resources for Farmers” page for grant information and hundreds of resources related to running a farm business.